Below are pictures to give a flavour of the exhibition. On this opening day some exhibits had not yet arrived and BBC Essex had not completed their display. Further pictures will be added in the coming weeks. Pictures taken on the evening of 18 March when Tim Wander spoke on Hall Street and Marconi: Building the wireless age. Pictures taken on the evening of 25 March when Dave Monk from BBC Essex gave a presentation titled The BBC and Me and my life behind the Mic. The Easter Bunny was in the audience. First, let me wish all Veterans a healthy and prosperous 2016. I would like to take this opportunity to welcome all new members to the Association and hope to see them at the Annual Reunion, which will be held on Saturday 16th April 2016. This will be the 80th Reunion and the venue will be the Marconi Social Club, Beehive Lane, Chelmsford, where there is ample parking for those who travel by road. The Bar is within the Main Hall (on the right as you enter the Club) and will open at 11.00 a.m.
Our President for 2016 is Veteran Valerie Cleare who, for many years, was Secretary/P.A. to a number of Directors and Senior Management within Marconi Communication Systems at New Street, Chelmsford including the MD of MIMCo. Joining the Reunion as our Honoured Guest is Mr. John Shrigley, Director of Personnel of GEC-Marconi Electronics Ltd. during the second half of the 1970s. We are pleased to maintain both the Subscription at £6.00 per annum and the cover price for the Reunion at £25.00. I am sure that you will agree that this is excellent value for a four course meal with tea/coffee and wine. As the Association has a very limited income, and in order to keep our expenses to a minimum, receipts for Subscriptions and/or Donations will not be issued unless requested so we thank you in anticipation. Those Veterans who wish to attend are requested to apply to the above address at the earliest possible date in order that I may properly assess the numbers. To reduce administration, please combine your ticket price, subscription, etc. on to a single cheque which should be made payable to ‘Marconi Veterans’ Association’. We often hear comments from Veterans that they would come to the Reunion but are afraid that they “would not know anyone on their table” or that “the speeches are long winded and boring”. If you feel this way, please read my articles in this year’s and the 2014 Newsletters, speak to a Veteran who does attend or give me a ring. Then, if you’re still not convinced, try it – if it really isn’t your ‘thing’ then there is no obligation to come again. Your assistance is requested with the seating arrangements and we ask you to indicate, on your ticket application, with which Company you would prefer to sit (i.e. Comms, Mobile, Radar, Baddow, Basildon, Marine, MI). Following a suggestion from a Veteran, we are compiling a list of forenames and nicknames in an effort to make the various lists less formal and enable people to distinguish between Veterans with similar initials. With regard to the name tags, last year’s arrangements seemed to work quite well so we will, again, produce the name tags on A4 sheets which will be at the merchandise table so you can collect your label as you enter the Hall. When you order your ticket, please indicate, in the box provided, how you would like your tag to read. If you attended the Reunion last year, it will read the same, otherwise, THE DEFAULT WILL BE TO PRINT YOUR NAME AS IT APPEARS ON THE FIRST LINE OF YOUR ADDRESS LABEL. We are, as usual, inviting entries for the ‘Absent Friends’ book, containing messages from Veterans who were unable to attend. Two copies will be produced and prominently displayed at the Reunion. If you wish to place a message in the book, please use the space provided on the enclosed form. Entries will be identified by name but no contact details will be provided unless you include them within the message area. Your Committee is prepared to receive any nominations, propositions or suggestions for submission to the Annual General Meeting. providing they reach me in writing by 31st March 2016. We now have almost 70 ‘Friends of the Marconi Veterans’ Association’. All ‘Friends’ receive the Newsletter and we will do all we can to keep them in touch with ex-colleagues but, regrettably, they are not eligible to attend the Reunion. The 2016 subscription for Friends is unchanged at £3.00. If you know of anyone who would like to be included, please urge them to contact me, at the above address, as soon as possible. We trust that you will accept this letter as a very cordial invitation to attend the Eightieth Reunion, but if, for any reason, you cannot be with us, your Committee would like to take this opportunity to wish you the very best of luck and good health for the future. This is a short reminder that the public exhibition at Hall Street, Chelmsford opens this Friday 11 March at 11.00 am. 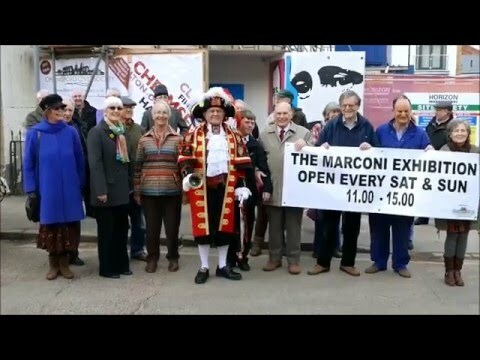 The event will formally be opened by Chelmsford’s town crier, Tony Appleton and Peter Turrall, chairman of the Marconi Veterans Association will be there to show visitors around until midday and to answer any questions. The exhibition will be open every Saturday & Sunday from 11.00am – 3.00pm with Free Entry, finally closing on Sunday 29th May 2016. Friday 18 March at 7.00pm Tim Wander, curator, Marconi historian, author – will speak on ‘Hall Street and Marconi: Building the Wireless Age’. Tim’s book ‘Marconi’s Hall Street Works: The World’s First Wireless Factory’ is made possible by a grant from Essex Heritage Trust with proceeds from book sales going towards the exhibition. Entry £5. Friday 25 March at 7.00pm Dave Monk, BBC Essex well known broadcaster, will speak on The BBC and Me and his life behind the microphone. Entry FREE. Friday 1 April at 7.00pm Ray Clark, broadcaster and author – All at Sea – the exciting story of offshore radio – ‘Radio Caroline’ the true story of the boat that rocked. Entry FREE. Thursday, 14 April 2016 at 7.00pm Tim Maitlin, Titanic historian, author and broadcaster, will speak on The Role of the Wireless in the Titanic Tragedy on the 104th anniversary of the sinking of the Titanic. Entry £5. Friday, 22 April 2016 at 7.00pm Dr Elizabeth Bruton from the Museum of the History of Science, Oxford will talk on The Battle of Jutland. As we approach the centenary of the battle, she will reconsider and re-evaluate the use and impact of wireless communications upon the battle, in particular decisions made by the British commanders. Entry £5.